With just under two months before 25th May, consumers are seeing a plethora of re-permissioning emails hit their inboxes. Some work (very well), others down right fail. In this article our General Counsel, Julian Palmer, considers what it takes to make sure your re-permissioning campaign (to send future marketing campaigns) works first time. Any good business knows who its best customers are, how often they interact and the amounts they spend. At the other extreme, the business may almost certainly have a group of customers that they are not sure where they got the contact details from. You could consider categorising your customers as demonstrated in the table below, or via some other classification. 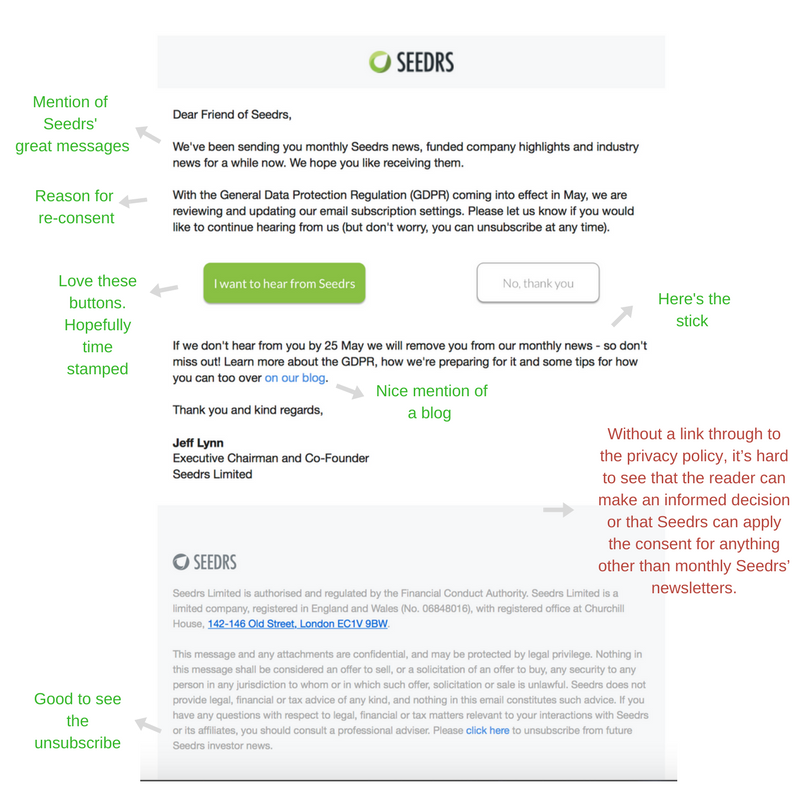 The aim is to grade the quality of the consent that the customer gave – you should have already considered whether you need consent in the first place in sending marketing emails. You have to have the mind-set that you may be asked to prove you have consent. It follows that if you have no idea where you got kate@address.com from, you should stop processing that address, irrespective of the fact that you know that she opens your emails and has not marked them in her inbox as junk. 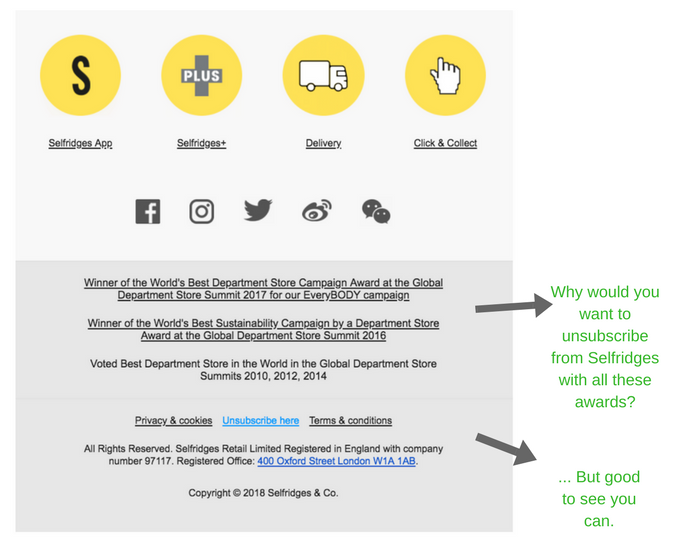 It also follows that you cannot send unsolicited marketing emails to someone who, for example, has given you his/her email address simply for you to email to them the receipt of their in-store purchase. Clearly, you had consent to send the receipt, but not subsequent marketing emails. When it comes to email addresses that have been supplied by a third party, you will have to consider the quality of the warranty given when you bought the data, along with any supporting evidence of consent. GDPR makes it clear that consent given as part of the terms of the sale of goods or services is not consent that can be freely given. As a consequence you will have to obtain fresh consent before 25th May. GDPR has a wider definition of consent, meaning that pre-checked boxes are out from 25th May. This is because there has to be an ‘unambiguous indication’ of your customer’s consent and a pre-checked doesn’t give the necessary affirmative action. Even the ‘platinum’ customers may not necessarily be marketed to after 25th May! Read very narrowly, this recital (an official comment on the Regulation, but not the law itself), could be saying that only the mechanism by which a person gives consent has to be in line with the requirement of GDPR, i.e. the indication by the customer – through, perhaps, checking a box or providing an email address. Is that what is meant by “the manner”? Most legal commentators have construed the term more widely, in the context of retail, taking the view that since there is prescribed information that must be brought to the attention of the customer at the first point of collecting the customer’s data, any past consent – even from ‘platinum’ customers – needs re-permissioning. Again, what you are working through is deciding whether a person – even one who has previously bought from you – has had periods of interactivity. Once you have worked through this classification, best practice (i.e. least risky) is to undertake a phased re-permissioning campaign starting with, in this case, platinum + opens emails and regularly buys. Much of the purpose of the foregoing processing is to ensure that if you go for a re-permissioning campaign you do not fall foul of the current law as happened with Honda and Flybe, resulting in fines of £13,000 and £70,000 respectively. You will get one crack at getting re-consent. Customers are simply not going to keep giving consent. It has long been recognised that there is consent fatigue amongst consumers – just look how most customers handle cookie consent. Consider what consents you want – email marketing, social media tracking, cookies. Have a simple mechanism for obtain affirmative consent. Time stamp the consent – so that it can be linked to the privacy wording, cookies policy and any other terms you publish at the time of obtaining consent. A central plank of GDPR (and the current laws on data protection) is that individuals are told what information is collected, the lawful ground for processing, the rights of individuals under GDPR, the data protection authority that individuals can complain to, along with details of who the retailer shares data with and whether the data is processed outside of the EEA (I.e. outside of the EU, Iceland, Lichtenstein and Norway). Avoid legalese – your customers are not all lawyers. Of course, some words are going to be words of art – cookies, data controller, EEA for instance, but avoid horrible words such as “hereinafter” or “aforesaid”. When describing the type of information that you collect, don’t forget the types of data that is collected by your email marketing solution, such as Ometria – such as IP addresses, metadata and data added through profiling. Use short sentences, avoiding the passive voice and use bullet points when providing lists (see Jimmy Choo). Make sure that you future-proof your policy so that it covers the business’ future plans. So now that you have seen a few good examples – and there are bound to be others in the coming weeks and months – you might be thinking that you can just rip the best of them off by replacing their business and contact details with yours. Privacy policies, cookie policies and terms and conditions are, like many documents, subject to copyright law. There are civil and criminal penalties for infringement. The templates come with guidance and also a level of legal support. An alternative that we have found is a firm in Germany offering this platform, which is quite good because it generates the policy from a series of questions. The policies are generated in English (or German). The point to recognise though when using such options, is that you are expending management time on creating your documentation, which may be better spent on retail marketing and sales. And finally, just a word of warning…. If you are going to be gushing about how you care about customer privacy and security, bear in mind that such sentiments will come back and haunt you if you have a data breach and a class action subsequently follows. Use your website. You could follow the likes of Manchester United and approach re-permissioning through alternatives to sending out emails. 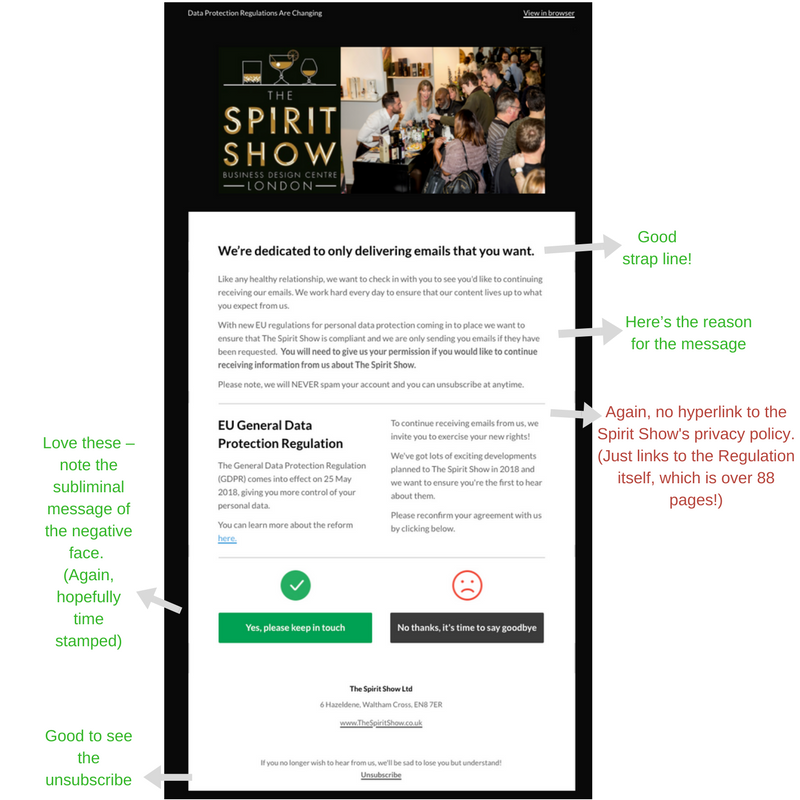 How about landing page pop ups, retargeted advertising and even good-old-fashioned snail mail warning that from 25th May your great email messages will not be landing in customers’ in-boxes as before?